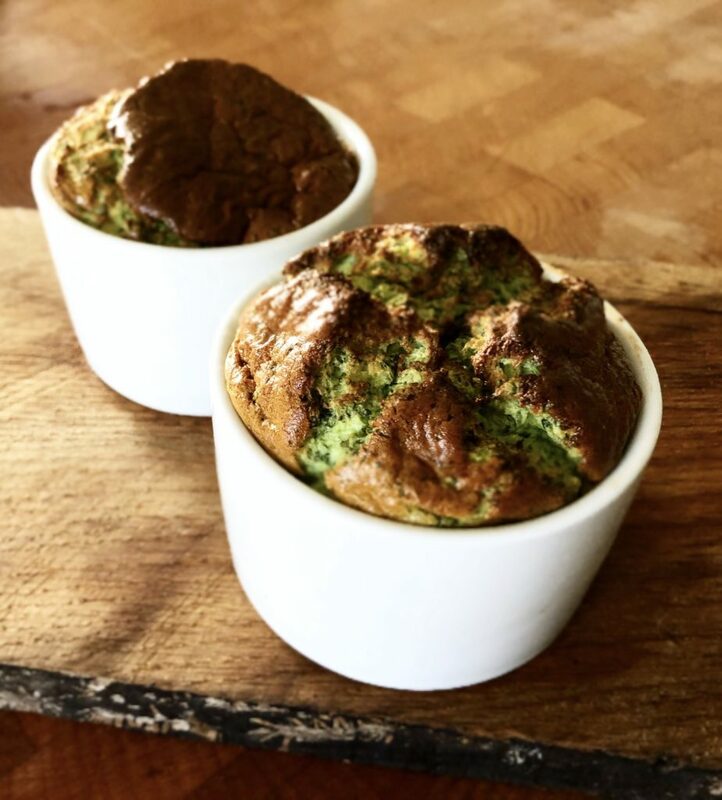 The next recipe I have for you for Love Watercress is a Gluten free watercress and stilton Souffle. If you are not a fan of blue cheese the flavour is subtle in this recipe but you could swap it out for your favourite cheese. I would serve this with a simple watercress and walnut salad tossed in a little rapeseed and balsamic vinegar. Preheat the oven to 180c. The souffles will be going on the bottom shelf of the oven. You need to make sure that the top shelf is far away enough that the souffles can rise safely without hitting the shelf above. Grease 6 oven safe ramekins with butter and put in a deep baking tray. Separate the egg whites and yolks. In a blender place the egg yolks, double cream, watercress, stilton, cream cheese and a good pinch of salt and pepper. Blend until well combined. In a stand mixer, or bowl using an electric hand whisk, whisk the egg whites with the cream of tartar until stiff peaks. Make sure not to over whisk the egg white at this point or it will be difficult to fold in. Take a third of the egg whites and gently fold into the egg yolk mixture. Adding a little of the egg whites to begin with as this will loosen the mixture and make it easier to fold in the rest of the egg whites and help keep as much air as possible. Once incorporated fold the rest of the egg whites gently in. Boil a kettle. Spoon the souffle mixture into the prepared ramekins. Get the boiled kettle and place the baking tray on the bottom shelf of the oven and fill the baking tray with about ½ inch of water from the kettle. Bake for 15-20 minutes. Do not open the door until 15 minutes has passed. The souffles should be risen, puffy and golden and when pressed in the middle they should feel set and springy. Serve immediately.